There are 5 posts tagged FAO (this is page 1 of 1). This week, the UN Food and Agriculture Organisation released its Global Forest Resources Assessment 2015 at the World Forestry Congress in Durban, South Africa. 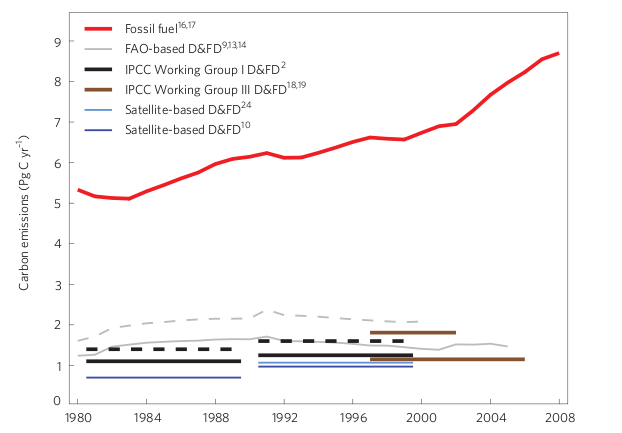 The good news, at least according to FAO, is that deforestation is slowing down. “How much carbon is emitted from tropical deforestation?” asks Daniel J. Zarin of the Climate and Land Use Alliance in the most recent issue of Science magazine. The answer may be considerably less than previously thought. Global deforestation accounts for nearly 20 per cent of all CO2 emissions. Everyone knows that. We’ve read it over and over again. The figure comes from the Intergovernmental Panel on Climate Change. But recent research takes a new look at the data behind the figure and comes up with a figure of around 12 per cent. For the second year running, Indonesia has the dubious honour of entering the Guinness Book of Records as the country with the highest rate of deforestation. According to the 2009 Guinness World Records, Indonesia’s deforestation rate was 1.8 million hectares per year between 2000 and 2005. This amounts to a loss of 2 percent of its forests each year.